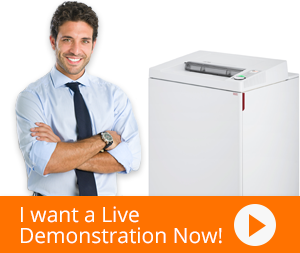 Our HSM Shredstar X6pro Micro-Cut Shredder or simply Shredstar X6pro is designed to shred 43 sheets per minute. It is very efficient in destroying documents by tearing each page into smaller bits that are about 2,010 micro-cut particles. It is a very efficient and ideal machine to use in a corporate environment, especially where there is the need to protect sensitive information. Government agencies and hospitals can benefit a lot from such devices. The HSM Shredstar X6pro Micro-Cut Shredder has a bin collection capacity of approximately 5.3 gallons. It also has a full-bag indicator that tells the user when it is time to discard or empty the components of the waste bag. This helps prevent an overload situation. In addition to this, the HSM Shredstar X6pro has the automatic start and stop function. This feature helps protect the machine from overloading or over usage. When it has been shredding for too long, or when the user inserts too much paper for shredding, the machine turns off and then on when it is ready for use. Similarly, the HSM Shredstar X6pro has a JamStop Anti-Jam mechanism. This technology helps by preventing unexpected jams in cases of an overload. It has an automatic and manual reversing function that helps remove the jam without ado. The Shredstar X6pro can also shred credit cards, papers, paper clips, store cards, staples, DVDs, and CDs. Unlike older technology, the modern technology (Energy Management Control System) used in the HSM Shredstar X6pro ensures minimum power consumption which has been reduced by 90%. Therefore, firms where there is the need to shred in large scale, it proves to be an energy efficient solution. The X6pro operates very quietly. It is designed to ensure that there is minimum disturbance, which makes it an ideal partner for professional work environments. All you can hear when using the X6pro is a whisper during shredding, which is hardly distracting. It comes with a lifetime warranty on the cutting cylinder. © Copyright HSM Shredders 2019. All Rights Reserved. Prices shown are in US Dollars. Prices are subject to change based on your order and delivery location(s) and the applicable retail store location.